Earier this year, I was at Oxide Design Co. the day they were moving to their new location, and “Superstar Designer Drew Davies” (a registered trademark of Andrew Davies) had these sweet magnetic animal heads all over his new space. I had seen them at his old spot, they have them placed on anything with metal, holding pens, memory cards, and assorted other items in their mouths, but didn’t notice the packaging he had done for them. 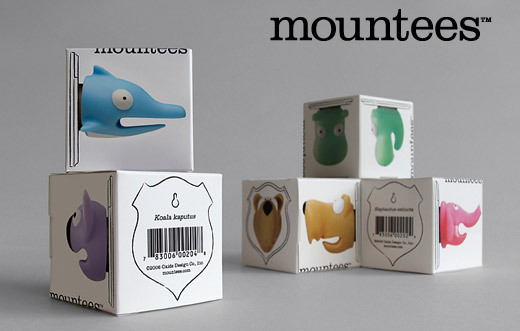 Each head comes in an award winning design (2007 Print Regional Design Annual) of a box measuring 2″ x 2″ x 2″. But it wasn’t until Drew’s wife asked why he brought over what appeared to be dry grass from the old office that I really took notice. Now I understand why he’s the Superstar Designer, and why we needed to get these in our store.